— This article by Jerry Cates was first published on 23 October 2015, and revised last on 12 September 2016. © Budsinthenews Vol. 6:10(9). Ricinus communis is variously known as the castorbean or castor-oil-plant, and is a flowering plant in the spurge family, Euphorbiaceae. The genus Ricinus and the subtribe Ricininae are both monotypic, as they contain only the single species Ricinus communis. Reproduction is via a mixed pollination system. That system favors self-pollination by geitonogamy, i.e., pollination of one of its flowers via pollen that drifts from a neighboring flower on the same plant. However, pollination also takes place via outcrossing, by either of the two processes described below. Outcrossing is the practice of introducing unrelated genetic material, from other plant species, into a breeding line. The process increases genetic diversity, which reduces the probability of an individual being subject to disease, while reducing the risk of genetic abnormalities common to strict inbreeding pollination systems. The first of the outcrossing processes used by R. communis is known as anemophily, which uses wind-blown pollen from unrelated plant species to pollinate its flowers. The second process, entomophily, uses pollen distributed by insects. 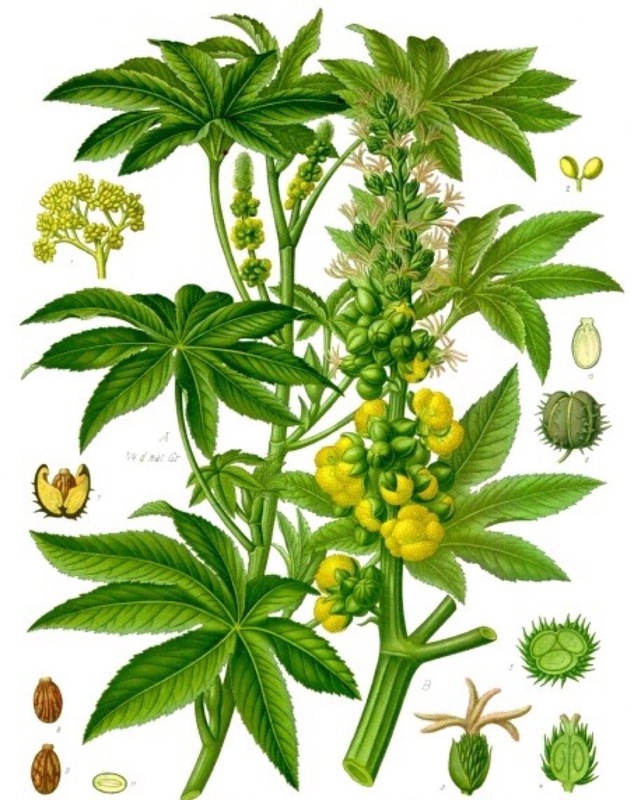 The seed of the castor oil plant is known as a castor bean. Despite that name, it is not a true bean. The castor oil plant is native to the southeastern Mediterranean Basin, Eastern Africa, and India. Today it is widespread throughout earth’s tropical regions and is widely grown as an ornamental plant in subtropical and temperate regions as well.